Posted in entrees, Greek, Middle Eastern, recipe, savory by Antonio Tahhan on April 25th, 2009. You can follow any responses to this entry through the RSS 2.0 feed. You can leave a response, or trackback from your own site. This is so refreshing Tony! perfect for those summer months. Looks perfect – not too much preparation (I wouldn’t want to spend 10 minutes more than necessary at the stove, thank you.) and delicious results. Wow, how easy is that! I bet the mint is really refreshing in the heat. Glad to you a new posting for you!!!! I hope every one is doing okay, regarding to your grandmother, and thank you my friend. This is nice a freshing dish indeed…. I hope every one is doing okay, regards to your grandmother. 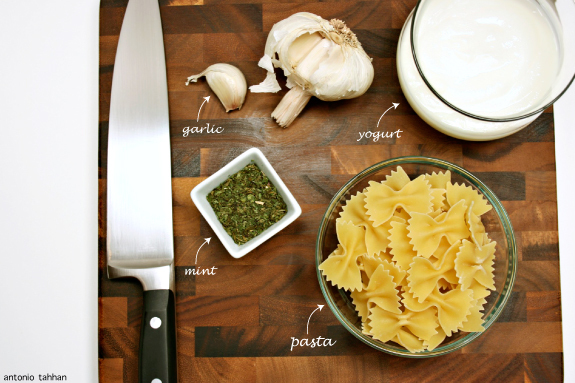 This is a nice refreshing and simple pasta dish. I love pasta any which way, but I’m even more of a sucker for pasta with a creamy sauce. 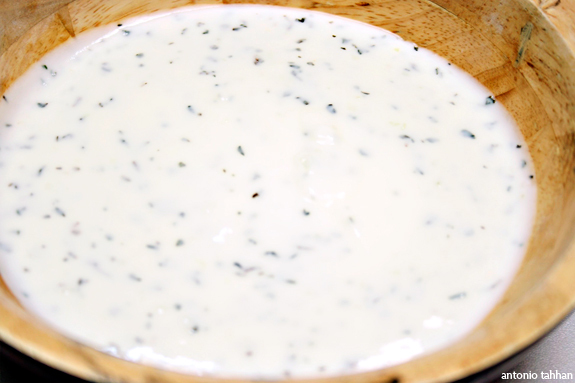 I added some Greek yogurt to a sauce I made a few weeks ago, but the mint here sounds really great. The yogurt makes this so much healthier than cream. Glad to see you`re on the roll again..hope you`re feeling better. 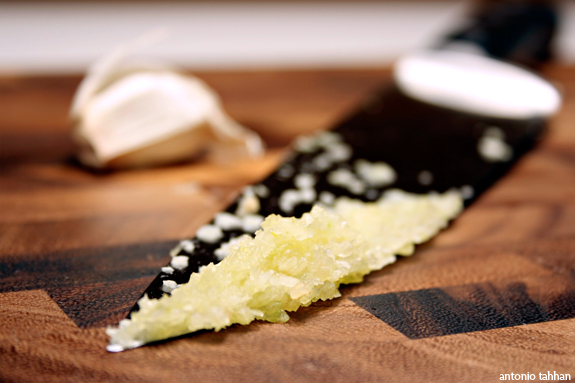 Thanx for the tip of adding salt while crushing the garlic..hmmm I didnt know that..I better give it a try! We can eat pasta everyday. I never saw that recipe before. Looks yummy. Great pictures. I found your blog via Tastespotting and just wanted to let you know you have a great site! The pasta looks delish and your photography is awesome! Good luck with everything and sorry to hear about your grandfather. Tony, I miss my grandparents and I wish they were alive now and to share my blog, food and memories with them. Call her (grandma), listen to her and cherish her wisdom and grab an extra recipe or two! 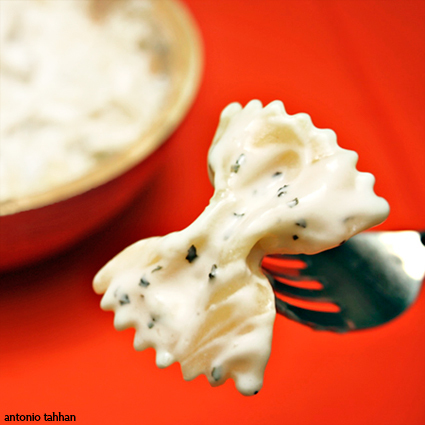 I love farfalle…my maternal grandma always used this shape too! I am always amazed by how the Turks and other folks from the Mediterranean incorporates yogurt into all types of dishes! These pasta are lovely. Definitely a keeper for the coming summer. I love your blog, your photos, your recipes and the step-by-step demo photos. Excellent work! This looks so beautiful, as are all your other pictures. You make cooking look so elegant, I almost forget about all the washing up that goes on behind the scenes!